The VB400 vertical benchtop optical system has a 16″ screen, 8″ X-axis and 4″ Y-Axis travel with fine adjustment, zero backlash and fast traverse, 16″ x 9″ top plate, quick change bayonet fitting lenses, Q-axis digital protractor with angular measurements to 1′ resolution and your choice of powerful Quadra-Chek or MetLogix software control systems. A time tested, cost effective, solution for non-contact measurement. They are simple to use, yet have great capacity and performance to satisfy an exceptionally wide range of dimensional inspection applications and complex measuring requirements. At the heart of these systems are precision optics, superb lighting and a highly accurate workstage which combine to ensure bright, sharp images and exceptional accuracy. Vertical systems are ideal when the parts to be measured are flexible or soft (plastic, thin stampings or electrical components) that are placed on the glass insert of the workstage. Fully usable 16” diameter hooded screen with overlay clips. Digital protractor for accurate angular measurements (1 minute resolutions) via Q axis on readout. Precision coordinate work stage with 16” x 9” top plate. 22-lb.load capacity with negligible deflection and 50 lb. maximum capacity. VB400-121: Comparator utilizes compact and precise digital readout for X, Y and Q measurements. Ideal for displaying linear and angular dimensions. Capable of absolute/incremental measuring, “Q” axis reads out in Angular coordinates. Readout is equipped with RS232 port for communication to a PC, and printers can be setup via the USB Port. An optional Footswitch is available. VB400-221: All the features of the VB400-121 with even more measuring capability. 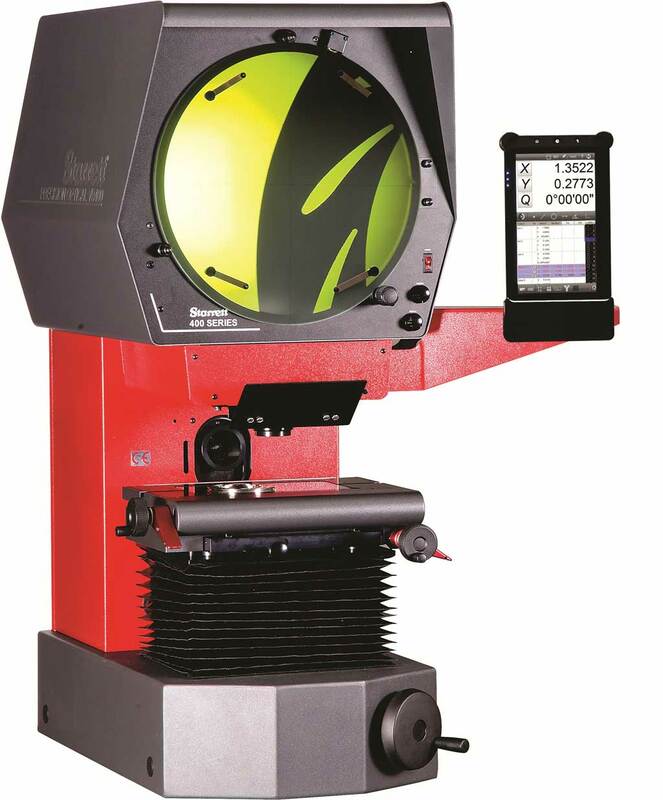 The VB400-221 includes the ability to measure 2D features such as diameters, radius, angle, lines and point features. Part skewing makes setting up quick and easy. Programs can be recorded to speed up the measurement of multiple parts. VB400-221E: All the features of the VB400-221 with added Optical Edge Detection. VB400-M2: includes the ability to measure 2D features such as diameters, radius, angle, lines and point features. M2 software provides an interactive 2D part view and part skewing for easy setup. Programs can be recorded to speed up the measurement of multiple parts. VB400-M2E: All the features of the VB400-M2 with added Optical Edge Detection.